Infos techniques As an improvement upon the " Westpreussen" type Dipl.-Engineer Hofmann brought out the high-performance glider "Schloss Mainberg," which had been built by the Kegel Aircraft Works at Cassel.The wing, with Gottingen 535 section, is likewise of single-spar construction ; it is unsupported, and built in three sections. As in the Westpreussen it lies on the upper surface of the body, without the intermediary attachment usual with other designs. The pilot's head is thus directly in front of the leading edge of the wing. The body, of plywood construction, is of egg-shaped section with a skid underneath ; it has three longerons with cross-frames. The attachment of the rudder is carried out in a similar way to that of the machine "Lore." The attachment of the elevator suspension was not satisfactory, so that it had to be strengthened during the Rhön meeting 1929. 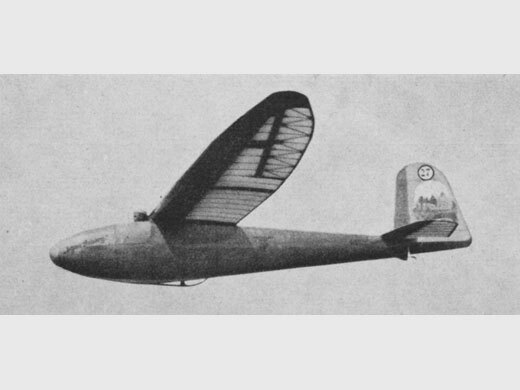 As a result of these small defects the machine, piloted by Dittmar of Schweinfurt, put in only a few flights. Histoire résumée Le Schloss Mainberg a participé au concours de la Rhön 1929, aux mains de DITTMAR. Mais en raison de quelques défauts mineurs il n'effectua que peu de vols. Il a ensuite été vendu au USA. Remarques Le volet de dérive de ce planeur est exposé au musée de la Wasserkuppe. par LANGSDORFF, Werner von (1931) [p. 145, 193. Note, 2 photos + specs]. par NAGEL, Rolf & BAUER, Thorsten (2015) [p. 88. Note + photo]. 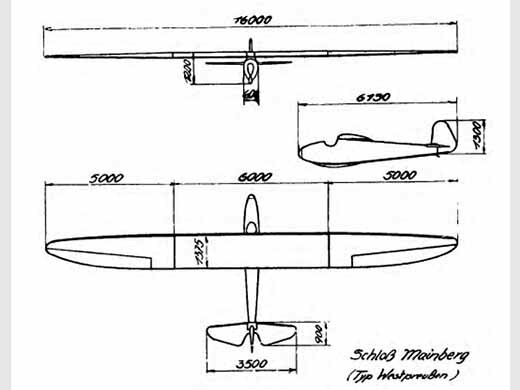 Autres sources Technical report of the Rhön glider meeting 1929, par A. Lippisch, Wasserkuppe, Rhön, The British Gliding Association Journal vol. 1 n° 3, janvier 1931 p 66-82. Publié in "Zeitschrift fiir Flugtechnik und Motorluftschriffahrt," volume 21, No. 4, p. 92 ; editeur R. Oldenbourg, Munich. Note + plan 3 vues + specs.